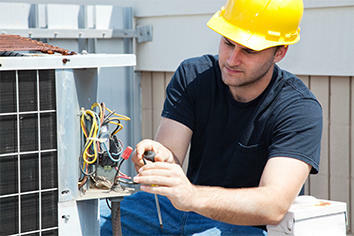 Home | Blog | Ask Our Experts: What Is “Metal Fabrication” Anyway? 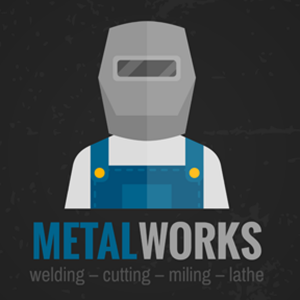 I am familiar with your HVAC, electrical, plumbing, remodeling, and restoration services, but I see you also offer something called metal fabrication. What’s that all about, and why would I ever need metal fabrication services? Look around you. Many people never notice it, but many of the products and components we take for granted have some aspect of precision sheet metal fabrication. From paper clips to aerospace parts, and all types of finished products and parts in between, these goods start out as metal or alloy stock. The sheet metal fabricator machines punch, cut, drill, bend, remove and shape this stock into an endless number of forms. Fabricators use their experience and mastery of a variety of processes, including welding, heat treating, adhesive joining, brazing and soldering, stamping and rolling, tumbling, buffing, polishing and honing. Fabricators take the customers’ desired material, the rate of production, the desired geometry and other physical requirements of the part or product to create an optimized, cost-efficient manufacturing process. When discussing the definition of metal fabrication, it helps to understand that metal is one of the most common types of raw material used in the manufacturing industry. The basic metal fabrication process forms, shapes and joins metal together through the removal or deformation of the material. Sheet metal stock has a thickness of between 0.006 and 0.25 inches, as compared to thinner metal called foil, and a thicker material called a plate. The gauge describes the size or the thickness of the metal. Normal sheet metal stops around 7 gauge (3/16”, .1875”). After that it is usually measured by plate thickness with inches. Anything thinner than 7 gauge normally measured by “gauge.” For example, 12 gauge has a thickness of 0.1046 inches and weighs 4.375 pounds per square foot. A 24-gauge piece of sheet metal has a thickness of 0.276 inches and weighs 1.156 pounds per square foot. The Manufacturers’ Standard Gage set the criteria for the thickness levels for standard steel, stainless steel and galvanized steel. The American Wire Gage (AWG) provides the Brown and Sharpe Gage used to determine the thickness and gauge for non-ferrous metals like brass and aluminum. Professional fabricators have a number of options available to create parts and products to specification and to also optimize the production process. Sometimes they must combine or build a complicated piece. The manufacturing process covers two primary categories: the removal process and deformation process. There are a variety of fabrication methods to produce the product. Cutting metal. The manual way of cutting metal with aviation snips continues to be one of the first tools fabricators use when working with metal fabrication. Power-scissors offer a way to cut metal more quickly and with less manual effort. Mechanical saw blades and laser beam technology are adequate for removing large amounts of material. 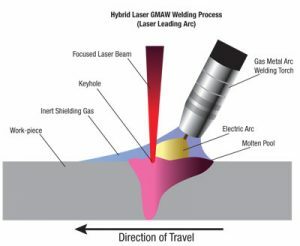 A laser is especially effective on carbon steel, stainless steel and titanium, in addition to metals like aluminum and copper alloys that reflect light and conduct heat. Machining. Fabricators remove material from a piece of sheet metal through machining – on a lathe, or by rotating the material against a cutting tool. Another option would be to use another cutting machine that has a rotating tool such as a drill. The number of axes in a machine defines the range of motion of the cutting head. Punching. The punch-and-die tool operates similarly to a pair of scissors. The tool uses pressure to create a hole in the material and remove the slug or scrap. The punch produces holes and cut-outs of various shapes and sizes. The most common punched holes consist of geometric shapes like circles, squares and rectangles. Blanking. This process removes a piece of material from the larger sheet and the desired part. Usually, fabricators blank multiple pieces in a single operation. Finished products range from jewelry to clock gears or watch components. Stamping. This procedure works similar to punching, but instead of cutting, the die makes a raised portion of the material, without penetrating. Shearing. The fabricator combines two tools to make a long cut on the sheet metal – one tool located above and one tool positioned below the sheet – to apply pressure to the material. Nibbling. This process cuts a contour by creating multiple overlapping notches or slits in the metal, which allows the fabricator to form elaborate shapes. The punch comes in a variety of sizes and shapes, including oblong and rectangular punches, which minimize waste compared to a round punch. When fabricators want to remove material without the need to create a deep hole, they use the milling process. The material removal stage constitutes the 2-D or shaping stage. The deformation process, such as bending or stretching creates a 3-D, complex shape. Bending. Some sheet metal components require bending. Most fabricators use a brake press or press brake machine. This machine contains an upper tool called the punch and a lower tool called the die. It can operate manually or automatically. It consists of a set of dies that pinches the metal to form a crease. This operation has a limited number of uses because of the movement of the component and the possible configuration shape of the dies. This method takes a flat sheet of sheet metal and bends or deforms the material to meet the intended design characteristics. A brake press along with the addition of manual computer numerical control (CNC) stops can specify the angle of the bend. The fabricator uses an overhead press, and a die set to both remove material and bend it in a single step. Roll forming. This process shapes the sheet metal through a progressive series of bending operations as the sheet metal stock proceeds through a series of roll stations. As the machine forces the material through the roller dies, the metal deforms and bends. The process requires the use as a lubricant to minimize friction and reduce tool wear. Spinning. Sometimes called spin forming, this metal fabrication method uses this process to fabricate cylindrical components by rotating a blank – a piece cut from the piece of sheet metal – while applying force to one side. This process produces a wide variety of products, including hubcaps, cookware, rocket nose cones, satellite dishes and musical instruments. Deep drawing. Commonly used with ductile metals, such as aluminum, brass and copper, the deep drawing process stretches the sheet metal into the desired component shape. A tool places downward pressure on the sheet metal. The tensile force applied to the material causes it to deform into a cup-like shape. It is a common process to fabricate cans, cups, kitchen sinks, pots and pans fuel tanks, and automotive bodies. Many custom fabricators use other methods to facilitate the material deformation process. The material selection represents one of the most critical aspects of the sheet metal design processes because it affects design integrity as well as cost control. Choosing the best material for your project can seem overwhelming. Keep in mind that certain fabrication processes work best with certain materials. Strong, light metals work best because they allow you to re-engineer the profile to use less material but have a structurally strong product. Galvanized sheet metal. This soft steel sheet has a zinc coating, which has a high resistance to rust. Good quality galvanized steel can undergo multiple bending and straitening without losing the protective zinc coating. Black iron sheet. This material, commonly used for products that require painting, has a thin coating of oxide that provides moderate protection against rusting. Aluminum sheet. Pure aluminum consists of a soft and ductile metal that has a whitish appearance. The appearance, lightweight and with a high-resistance to corrosion, makes aluminum a popular choice for mass-produced products, such as kitchenware, trailer parts and thousands of other small components. Customers can choose from various alloy content levels – 1000 series to 7000 series, for commercial products. The 1000 series consist of 99% pure aluminum. Stainless steel sheet. This material has an untarnished surface appearance and superior corrosion resistance. The material is easy to cut and weld without damaging the piece. Its resistance to corrosion makes it a popular choice for applications where the product requires high corrosion resistance. Stainless steel consists of high-grade steel with chromium and nickel additives. It has three classification levels based on the alloy content. Galvanized sheet metal may be the most commonly used of all sheet metal materials. It can be used in most applications, including those that require welded joints. Other material options for custom metal fabrication include copper, brass, gold, iron, nickel and silver. 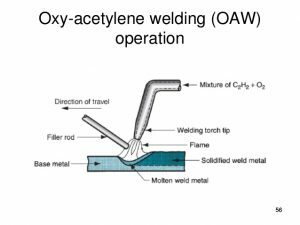 Oxy-Acetylene Welding, the oldest method of sheet metal welding, is still widely popular for its precise use of a controlled flame to heat the metal. Image Source: Slideshare.net. Oxy-Acetylene Welding. Although it is the oldest method, many people continue to use Oxy-Acetylene welding. It relies on tanks of oxygen and acetylene and an adjustable torch. The precise, controlled flame heats the metal, and the welder adds a filler rod to join the metals together. The method produces soft, pliable welds that are easily smoothed out with a hammer and dolly to get a flat weld joint. 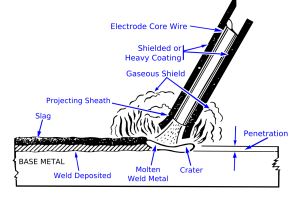 The process of GTAW (Gas Tungsten Arc Welding), better known as TIG (Tungsten Inert Gas) Welding. TIG Welding is the most used method by professional welders in the industry. GTAW (Gas Tungsten Arc Welding), better known as TIG (Tungsten Inert Gas) Welding. This is the most used method by professional welders in the sheet metal industry. The torch has a non-consumable electrode, which generates a small, precise electric arc that melts the base metal. The fabricator adds a filler to the puddle of molten metal with the other hand. Fabricators prefer TIG welding because it offers more precision. GMAW (Gas Metal Arc Welding), better known as MIG (Metal Inert Gas) Welding, is the most common for fusing together heavy sheet metal. It also creates the hardest weld. Image Source: LincolnElectric.com. GMAW (Gas Metal Arc Welding), better known as MIG (Metal Inert Gas) Welding. MIG welding is the most common welding method because the method is easy to learn. This welding technique uses a motor that feeds the filler through the tip the MIG gun. When the wire touches the metal base, it completes the circuit, which melts the wire into the joint. This method, which is common for fusing together heavy sheet metal, also creates the hardest weld. Shielded Metal Arc Welding (SMAW), better known as Manual Metal Arc Welding (MMA) or Stick Welding, uses a consumable electrode to lay the weld. Image Source: Wikipedia.org. Shielded Metal Arc Welding (SMAW), also known as Manual Metal Arc Welding (MMA), but best known as Stick Welding. 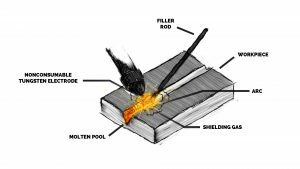 Stick Welding uses a consumable electrode covered with a flux to lay the weld. When beginning a brand new project, it is essential to have some concept of the design. It is not necessary to have the exact specifications for the final fabrication manufacturing. However, it helps to have a general idea of the finished product and some idea of the specific features and functions it needs to perform, as well as any dimensional constraints it requires. Some customers have a difficult time conceptualizing the product. This is where an experienced metal fabricator can provide design services to demonstrate the possible design prior to beginning production. This will ensure an optimized sheet metal fabrication process. You should define what you want the product to do. Also, consider the functionality, the minimum and maximum length, durability, flexibility and other elements to begin creating the design. CAD prototype. After you determine the initial configuration for the custom metal fabrication design, a fabricator can generate it in a CAD program. This will create a 3-D rendering of the part or product. The software also produces 2-D schematics that can help customers visualize the product before the start of the manufacturing process. The CAD drawing can help you determine if the product is satisfactory. It will also provide a clear idea of what the product will look like without the need to have a prototype. Any noticeable issues are then corrected. Tooling. If the custom metal work requires assembly, this step allows you to evaluate the first-run piece and make sure it functions properly. The final design for weld seams and fasteners can turn out different compared to final design and the CAD drawing. This should be addressed prior to the final production run. The solution may be to adjust the weld parameters or change the type of hardware. In addition, you can address any problem with tooling, such as adjustment of the calculation on the press brake, to meet the dimensions specified for the fabrication. After building the tooling, you can fabricate a first-run production work piece. Tolerance. Some precision sheet metal fabrication products require a tight tolerance, which determines what process the fabricator will employ to manufacture the part. A wider tolerance allows the fabricator to use a low-cost production method and to produce the parts at a faster rate. Customers usually maintain tighter tolerance where needed and use a wider tolerance on nonessential features. This approach helps lower the overall manufacturing costs. The customer should also determine if the product requires additional hardware or assembly before shipping. It pays to weigh these costs when deciding whether to provide hardware or pre-assembly. Calculate the quantity per batch because it affects tooling, raw material and design optimization and provides an accurate estimate of the total cost of the metal fabrication project. Design Services. This will help with the conceptualization creation analysis of parts and characteristics. Build/Fabrication. This is the creation of the actual metal product. Finishing and Assembly. Post-fabrication techniques and treatment required to improve quality and finish are completed with this service. Many commercial and residential customers order custom metal products fabricated from a range of commonly used metals and their alloys. In short, we hope to become your office, warehouse, or industrial plant’s one-stop shop for mechanical systems and metal fabrication services. If something in this post has caught your eye, we invite you to learn more at www.tuckey.com, e-mail us at info@tuckey.com, or call at (717) 945-0445.